Sony PlayStation 3 (500GB) review | What Hi-Fi? It looked a premium product, but in terms of size it could give some home cinema amps a run for their money. A slimmed-down version launched in 2009, and now there’s this 'super slim' one – which is half the size and weight of the original and almost 25 per cent smaller than its predecessor. Storage is up from 120GB on the old ‘Slim’ to a much more generous 500GB but there’s also a version with 12GB of flash memory. The latter is for those who’d prefer to install their own, 2.5in SATA hard drive. But it’s not all good news. Gone is the quality finish and feel of the predecessor, although the curved design survives to an extent. Gone too is the slot-loading disc drawer. This has been replaced by a flimsy-feeling, ridged cover, which slides back to reveal the mechanism. It’s a bit of a crude, cheap-feeling contraption compared with the previous models. The features remain the same. Blu-rays, DVDs or CDs can still be spun, and the PS3’s multimedia skills remain unchanged: you can stream content from networked devices and through on-demand services such as Sony’s own SEN (Sony Entertainment Network) and BBC iPlayer, ITV Player, and 4oD. Music lovers can also rip CDs to the hard drive up to 320kbps at AAC standard. As for picture and sound quality? Well, nothing’s really changed. The PS3 can’t match a dedicated budget Blu-ray deck such as Sony’s own BDP-S390 or Panasonic’s DMP-BDT220, but detail levels are good, colours are nicely judged and motion is handled well enough. Sound errs on the lean side, but it’s agile and clear. 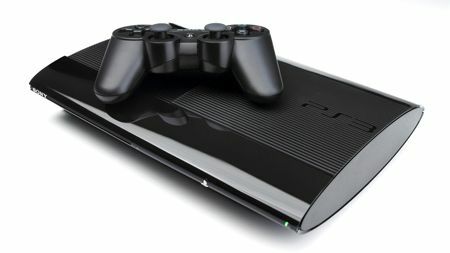 The new PS3 Super Slim feels like a stop-gap until the next generation of the console is launched – the rumour is June 2013 – and those that already own the console don’t have a huge incentive to upgrade. But if you haven’t considered a PS3 before, then now could be a good time to strike given the price and 500GB hard drive.